An illustrated Inuit guide to the things that go bump in the night. Forget werewolves and forget vampires! Let yourself be drawn into the dark world of the shape-shifters, ogresses, trolls, and demons of the Canadian Arctic. This collection of field notes meticulously documents the dark side of Inuit legends, complete with hideous monsters and unspeakable deeds. Each creature is brought to life by the stunning illustrations of Mike Austin, a world-renowned tattoo artist. 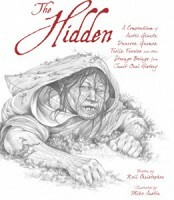 Exposing the beings that lurk in Arctic shadows, this gothic illustrated book is destined to become a collector's item for any reader interested in dark folklore.